Third Night – New York | Grandpa Ham - Grandpa Can do IT! Yep. 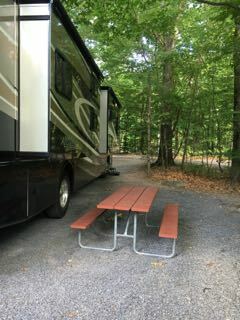 This is a picture of a KOA campground half way between New York City and Albany. This campground has the feel of being in the middle of nowhere. There are LOTS and LOTS of trees. The nearest restaurant is 7 miles away. The roads are small and narrow. The closest industry is a state penal facility. Still, the campground is crowded and cramped (which perhaps preps the campers here for the advertised bus trips from here into New York City itself).